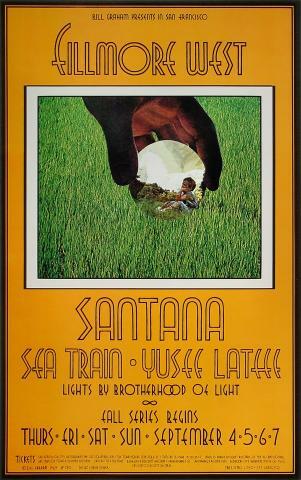 SIZE 4 1/2" x 7 1/16"
Santana's draw was reflected by the reduction in size of Singer's collage to accommodate a focus on the band's name in this Fall Series poster. The handbill was printed before the concert and presents a calendar of upcoming Bill Graham events on the reverse. It measures 4 1/2" x 7 1/16". There were also some pre-concert postcard mailers printed that were conjoined with the BG189 image (see BG189/190). They measure 7 1/8" x 9".